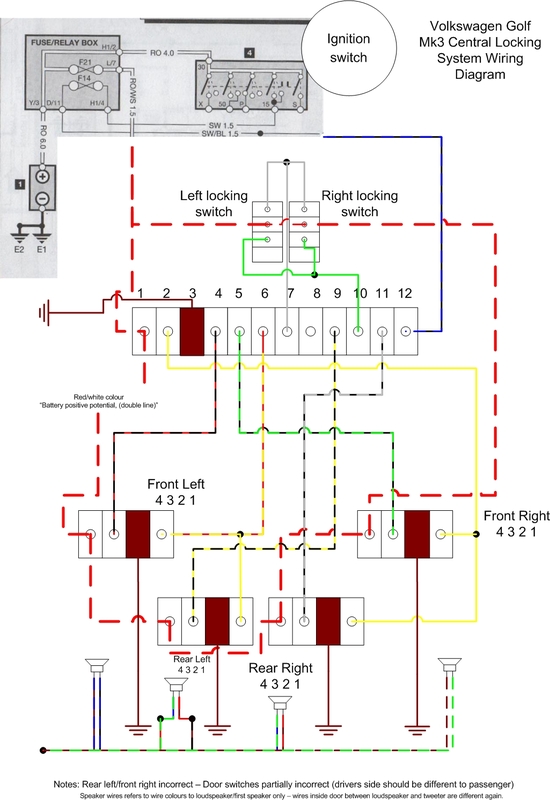 I intended to write a page dedicated to the operation of how the central locking system and electrics work, however never got the time to ensure accuracy because, basically, I don't know what I am doing with the wiring, I'm going to try and add information to this post when I get time. Lots of thanks to Dougie (who resides on the ClubGTI forum) for the information regarding how the central locking vacuum pump works. The following information must not be assumed to be fully accurate. The central locking system is equipped with a deadlock system which blocks unlocking the doors from the locking knobs on the inside, it accomplishes this by a mechanical solenoid on the door locks which is activated from the integrated central locking vacuum pump/electronic control unit in the boot. When the control unit detects that a door has become unlocked it immediately invokes 2 actions. 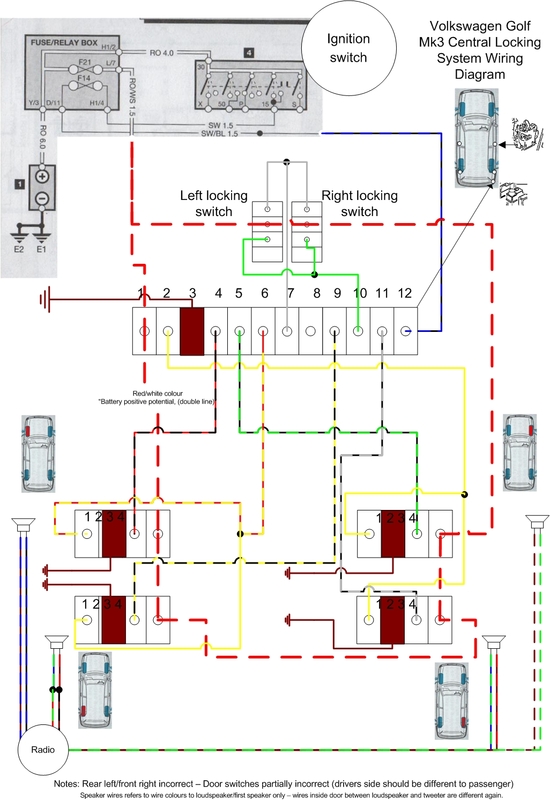 Whilst the vacuum pump is operated the control unit monitors the lock state of all 4 door locks - the vacuum pump is switched off once all door locks are giving a locked signal. If this does not occur the vacuum pump will continue to run for a period of approximately 30 seconds, and then times out. 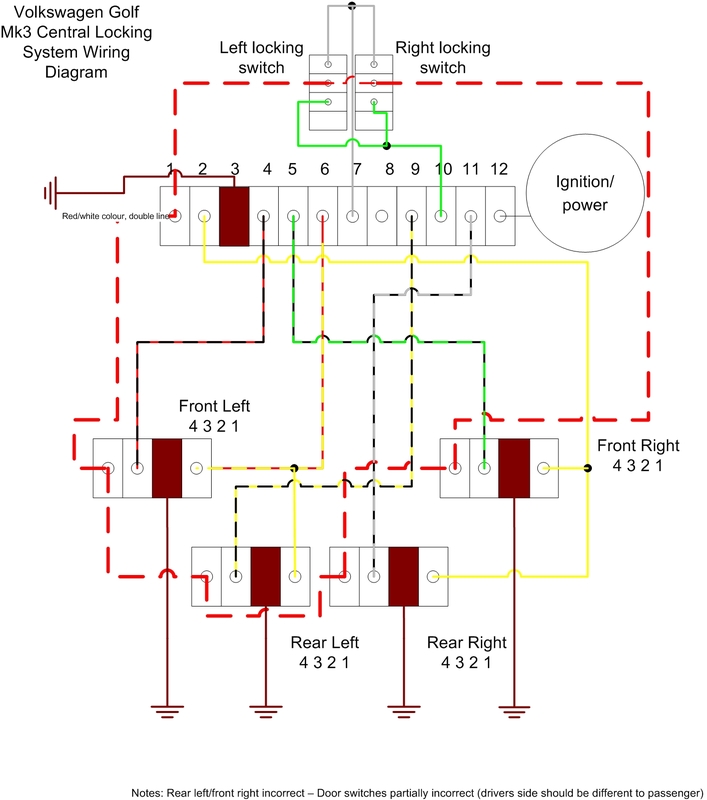 The deadlock solenoids still remain active. One may notice that on the first attempt at trying to unlock the doors from the inside, it is actually possible to pull the locking knob up before the vacuum pump is activated -- even so, the deadlock solenoid still prevents the door from being opened regardless of if the locking knob is pulled up.